whats on in Skegness 2019. 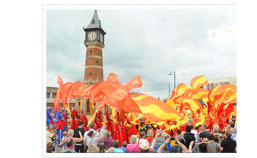 Take a look at the Visit Skegness picture gallery- full of shots taken during last years exciting events such as the fabulous SO Festival, The Olympic Tourch Relay and more. There are also plenty of general photos for anyone who just wants to take a look around this fabulous resort. 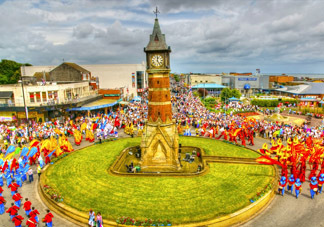 Skegness is one of the top Seaside Holiday destinations in the Uk. Our website is here to provide you with all the information you could possibly need and more ready for your 2019 holiday in Skegness, from accommodation to places to visit and where to eat we have it all covered. A Happy and Prosperous new year from all at Visit Skegness! The first half term of the season is slowly approaching, the caravans and hotels are slowly opening and this years acts rehearsing. It promises to be another record breaking season here in Skegness and we hop that you will come and join in with the fun. We are in the process of a creating a brand new website, watch this space! Click here for information on all events. The season is now in full swing, but don't worry there is still plenty more to come. To see the next batch of upcoming events please click more. From family activities to adult shows at the Theatre, take a look at our attractions zone and keep your eyes peeled for our money off vouchers. More deals coming over the coming weeks. 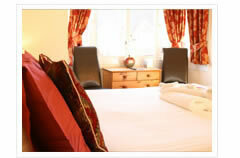 Skegness Accommodation - Where to stay. From the traditional Bed and Breakfast outlets to Hotels, Caravan Holidays, Guest Houses and Self Catering Appartments in the town. Have your say about all things Skegness. From holidays to local activities our forum offers useful advice and a chance to chat to the locals please Click Here. 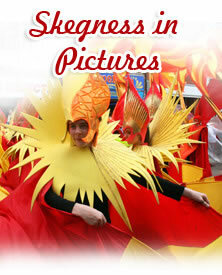 Great deals on attractions, money saving vouchers are available for free download. Home to the first ever Butlins Holiday Resort and a hub for tourism, Skegness is a town with a rich and distinguished history. This new title by local author Ken Wilkinson celebrates the town's heritage, taking a nostalgic look and revealing some of the changes and developments that have taken place over the years. A little piece of history - it is known that Skegness has been occupied since before Roman times. Roman pottery can be found today on the shore, it makes a change from collecting sea shells! Salt was manufactured along much of the low lying coast of Lincolnshire in Roman times and evidence of their working sites and even artifacts bearing their fingerprints can still be found today. Visiting Skegness on the Lincolnshire Seaside became ever more popular over the years though at first only the better off people were able to take advantage of the facilities provided in Skegness. In the 1870's the Earl of Scarborough, landowner of Skegness at that time, decided to improve the town and with estate agent V.Tippet plans were drawn up for new streets and houses which extended to what is now Scarborough Avenue. Just up the coast from Skegness is the tranquil town of Mablethorpe which is perfect for a day out with the family. In Mablethorpe you can visit the Sea Sanctuary, take a walk on the beaches, shop till you drop and much more. If you are more of a thrill seaker then why not Visit Cleethorpes in 2019 which lies just 20 miles further up the coast and has a wealth of attractions. 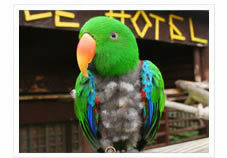 Send mail to webmaster@skegness.net with questions or comments about this website. Copyright © 2019 Visit Skegness. All rights reserved. Follow us on Facebook! Come and find the latest news .